John 2:13-22 – The Passover of the Jews was near, and Jesus went up to Jerusalem. 14 In the temple he found people selling cattle, sheep, and doves, and the money changers seated at their tables. 15 Making a whip of cords, he drove all of them out of the temple, both the sheep and the cattle. He also poured out the coins of the money changers and overturned their tables. 16 He told those who were selling the doves, “Take these things out of here! Stop making my Father’s house a marketplace!” 17 His disciples remembered that it was written, “Zeal for your house will consume me.” 18 The Jews then said to him, “What sign can you show us for doing this?” 19 Jesus answered them, “Destroy this temple, and in three days I will raise it up.” 20 The Jews then said, “This temple has been under construction for forty-six years, and will you raise it up in three days?” 21 But he was speaking of the temple of his body. 22 After he was raised from the dead, his disciples remembered that he had said this; and they believed the scripture and the word that Jesus had spoken. A long, long time ago, in the year 350, there lived a man named…Augustine. He tells his story in a book titled The Confessions – he simply pours it all out, the good, the bad, and the ugly…saint and sinner…all of it…and how God met him in the middle of it. Fast-forwarding sixteen hundred years to this past Sunday, I was preaching at a congregation that I had preached at one other time, one year ago. A woman came up to me before worship began and told me that she needed to speak with me. So we arranged to meet back up after the service. We sat together in the back of sanctuary, the worship space. This was her 3rd time visiting this congregation and she told me that had spent very little time in church throughout her 60 years. In the span of just a few minutes and speaking quickly, she spoke of the sin in her life, some of which had happened over 30 years ago. She then told me that she was too much of a sinner to be in church and then she fell quiet. So, you may be asking yourself, what do St. Augustine and this woman have in common – across time, gender and life situation? St. Augustine wrote, all those many years ago, that sin can be described as what comes from the mixing up of what God has given us to use and what God has given us to love. His argument is that God means for us to love God and use things but somewhere along the way we use God and love things…we use God and love things. We have mixed up use and love. Today’s scene in the temple started me wondering about this mix up between what we use and what we love. Jesus is furious. The temple has become a marketplace, a place where God is being used and everyone is part of using everyone else as a commodity, as currency, as cash. Relationship has been transaction. If we’re not very careful in this story, we end up standing behind Jesus, cheering him on, placing ourselves on his side, comfortable that our opinions about God and Jesus are the blameless ones. I wonder, though, if our rightful place in this story is in the position of the sellers – the ones who use God and love things so much so that in our use of God we end up using each other in such as way that our relationships are transactions. We see this time and again, right? The ways in which we use each other, and the ways others use us, create deep pain. Let’s be clear, while we’re at it, that this is not only a problem magnified within these walls, this is a problem within this world, inside all of us! And it is into the mixed up mess of use and love that Jesus comes crashing in to clean house. 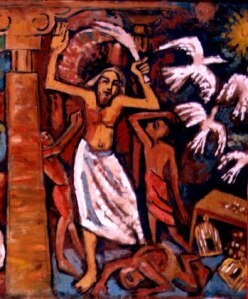 Jesus cleans house by first taking the problem into his own body. In the Bible story for today, Jesus says that his body is the temple which will be destroyed – hung on a cross – and that he will raise it again three days later. There is hope after all because Jesus does what we cannot do when left on our own – first in his body and then in ours. Jesus fights this fight in us daily by virtue of our baptism. Jesus attacks our sin and sends it packing, right out the door like the sheep and the cattle of the temple. In his clearing of the temple, Jesus challenges us to look at the way in which we use and the way we love. In his dying on the cross, Jesus destroys the power of sin and its death dealing way. And in his rising again, Jesus heals us into new life. In the name of Jesus Christ, may you be strengthened and filled with God’s grace, that you may know the healing power of the Spirit. Amen.